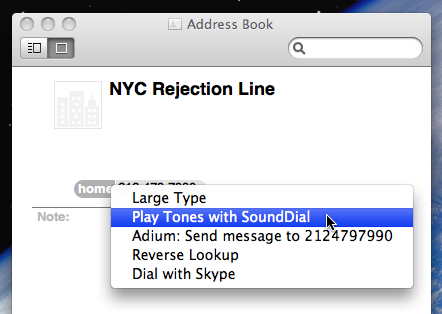 SoundDial is a simple Mac OS X application for generating telephone dialing tones. It comes with a Address Book Plug-In so you can play tones directly from Address Book. You can also save tones to an AIFF file for later playback. If you want to use your computer as a speed dial, download the application. The latest version is 1.0.10. It should run on Mac OS X 10.4 or later. If you want to see how it works, you can also download the source code. The source code is not needed to run the application.